A massive 8.2 magnitude quake has struck off the coast of northern Chile, killing 6 people and sending a 2-meter tsunami wave. Over 900,000 people and 11 hospitals were evacuated along the coastline, government officials said. Hundreds of thousands of people evacuated from low lying coastal regions after a tsunami warning returned to their homes Wednesday morning as damage from the the quake appeared limited. 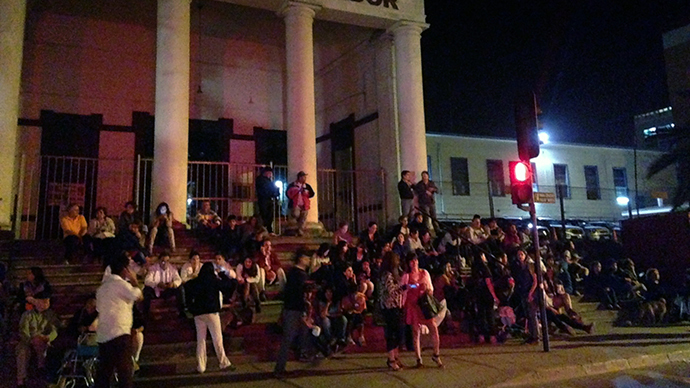 Damages and fires had been reported throughout the region and many have lost power because of the quake. At least six people have died following the quake, Chile's Interior Minister Rodrigo Penailillo said. Many of the victims died from heart attacks or falling debris. The country’s president, Michelle Bachelet, has declared the region around the epicenter a “disaster zone” and praised Chile’s emergency services for their swift response to the crisis. Several aftershocks - ranging from magnitude 5 to 6.2 - were detected in the area following the earthquake. All of the Latin American Pacific coast is under threat for tsunami activity, according to the US Geological Survey (USGS). In addition to Chile, a tsunami warning has been issued for Peru, the Pacific Tsunami Warning Center said. Tsunami watches for Colombia, Panama, Costa Rica, and Nicaragua have been cancelled. Aleuy said the tsunami alert for Chile’s coast will last for at least another six hours after the quake, Reuters reported. The Chile National Office of Emergency of the Interior Ministry (ONEMI) ordered a preventative evacuation for the coastal areas of Arica, Parinacota, and Tarapacá, La Tercera reported. Peruvian authorities have begun evacuating areas in the southern coastal region of Ica, RPP radio reported. About 200 people left the seaside town of Boca del Rio, Peru, according to AP. No injuries or major damage occurred, said Col. Enrique Blanco, regional police chief in Tacna, a city of 300,000 on the Chilean border. Chile's main mining companies said there was no serious damage to their operations. Hundreds of earthquakes have occurred along Chile's far-northern coast in the past two weeks. A 6.7 magnitude quake hit on March 16, causing the brief evacuation of 100,000 people in low-lying areas. No tsunami followed. An 8.8 magnitude quake and accompanying tsunami hit central Chile in 2010, killing over 500 people and destroying 220,000 homes, among other damage.